Hypopigmentation refers to the ‘loss of skin color’ caused by the less production of skin pigment melanin. When the amount of amino acid tyrosine gets low in our skin cells, the melanocytes (cells that are known to produce melanin) become unable to generate sufficient melanin. As a result, our skin starts to get discolored. Hypopigmented scars are basically injured sections of our skin, which have become flat as well as pigmentless. When an injury goes deep into our skin and causes damage to our blood vessels, the melanocytes present at that specific part of the body become unable to produce enough melanin to match the complexion of the adjacent skin. Even though the scar gets repaired automatically in absence of the fibrous tissues, the skin fails to restore its actual color. Hence, we see a white scar once the dry skin goes away. Ginger is the root or rhizome of a plant, which is scientifically termed as Zingiber Officinale. Although the main application of this ingredient is found in cooking, it can be used to treat a number of health as well as skin issues including hypopigmentation. Ginger is considered as a traditional Chinese medicine and you should certainly give it a try to cure your skin discoloration. Several studies have proved that the topical application of this root can help us get rid of hypopigmented scars successfully. 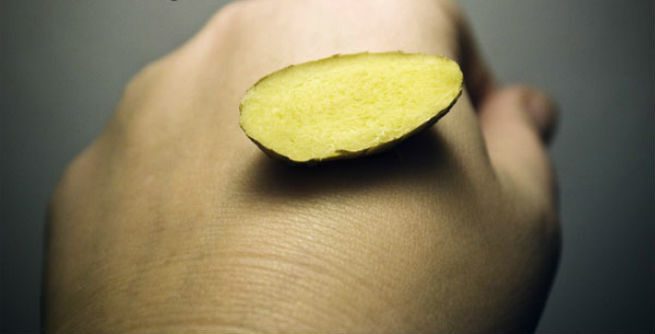 How Ginger Can be Used to Treat Hypopigmented Scars? Take a small slice out of a fresh ginger and rub the hypopigmented scar present on your skin with it. Do it in such a way that the juice comes out of the ingredient and the affected area gets moist easily. Let the juice stay at that part of your skin. It will go into your skin cells and start working immediately. As the juice gets absorbed by the skin completely, there is no need to wash it off. Do this at least 2 to 3 times a day. Make sure that you use a fresh slice of ginger each time for the best result. You will notice a change in your hypopigmented scar just within a couple of week and the entire section of the skin will get back to its earlier condition in 6 to 12 weeks.